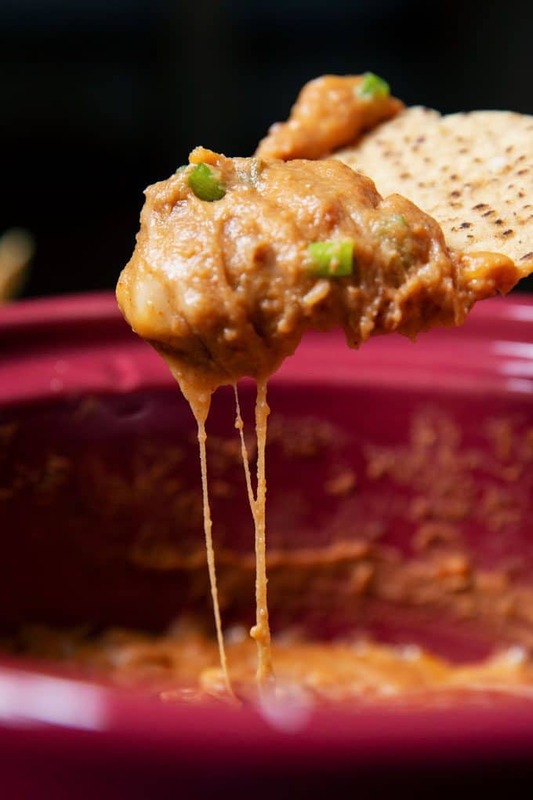 This creamy slow cooker refried bean dip is the perfect game day party appetizer. It has just the right amount of cheese, green onions and cream cheese. 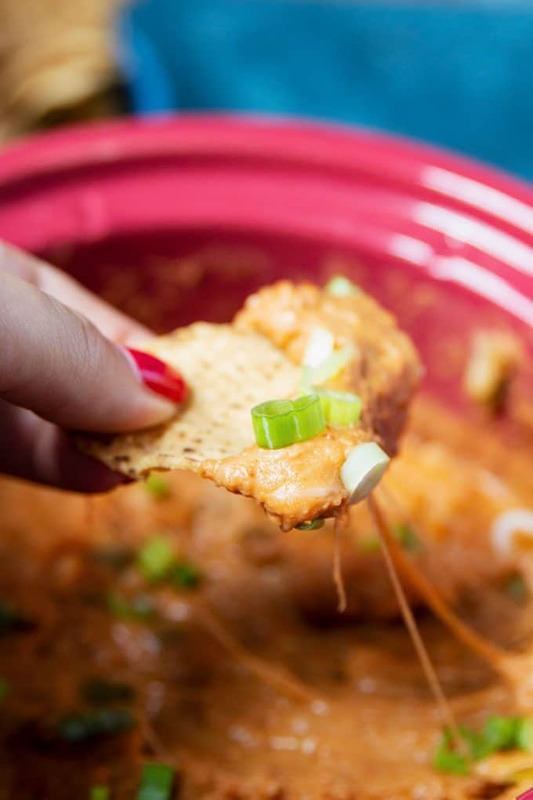 Add a jalapeno to make it a spicy bean dip recipe. Is it bad that I am pretty happy eating appetizers? If I could, I’d probably eat taco dip and jalapeno poppers and chili cheese dip and a whole slew of other small plates, and that’s about it. Thankfully, I know that I should eat well-balanced meals. I don’t snack and eat like I’m living through the world’s longest cocktail party every day, even if I want to. Getting my little crock pot really has been dangerous though. Before I bought it, I mostly made a lot of cold dips full of mayo. I have since graduated to hot dips with lots of melty cheese instead. Not sure what’s worse for you, but I am sure they are both bad for you. Thankfully, I don’t entertain as often as I’d like to and I have been going out with friends a little more to socialize. I hope one day I can forget about my love of bean dips and other apps and lean towards brussels sprouts and pork chops. 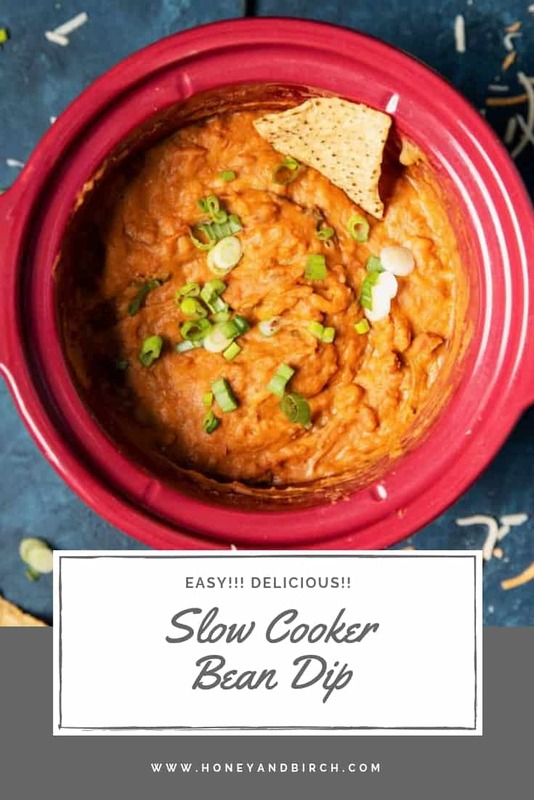 Slow cooker taco dip is a huge hit in my house but this slow cooker refried bean dip is an even bigger crowd pleaser. Luckily, with the mini slow cooker, you can put it out on any size table. People hanging out in the yard? Your slow cooker can follow you. The recipe only uses a few ingredients so it’s very quick to put together. 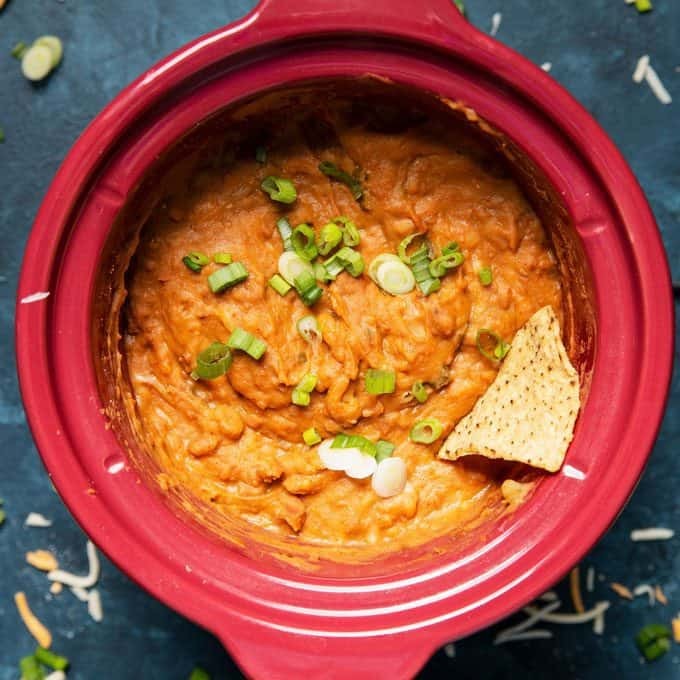 Using canned refried beans will help decrease the prep time as well. I’m such a huge fan of good refried beans! 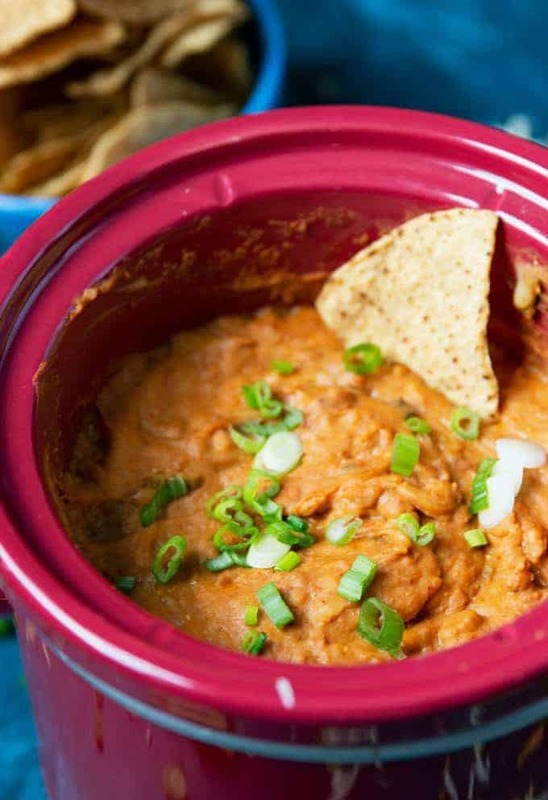 When you’re ready to make your refried bean dip, just add everything to your slow cooker. You can spend the next two hours cleaning or prepping other food. Or relaxing. That is how I would prefer to get ready for a party! I’ve served this for game day parties and BBQs – it won everyone over. Grab a bag of your favorite tortilla chips (or make your own chips!) and you are good to go. Lightly grease a 2 1/2 quart slow cooker. Add all ingredients except the cheddar cheese to the slow cooker and stir well. Cover and cook on low for 2 hours. At the end of cooking time, add the cheddar cheese and stir until melted. Serve with tortilla chips. If you are interested in making a spicy bean dip, add one minced jalapeno in step 1. Thanks! I would love to hear if you like it! OMG I LOVE BEAN DIP! YAy thanks im printing this and using it this weekend! 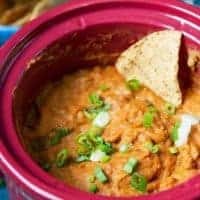 I make a white bean dip that my hubby loves but have never made a hot version and will be trying this one. thanks for the great recipe. will help out alot since i have started to cut down on eating meat. You’re welcome! Thank you for visiting! Thank you! Have a great night! Bookmarked! This is perfect for parties. Thanks for sharing! This sounds tasty AND easy! How is that for a win/win? I just might be bringing this to the Super Bowl party! Thanks!! If you try it, let me know if you like it. I could live on appetizers if the rest of the family would. Good for you and delicious! Thanks Sandy! This is why I love reading posts! I learn something new every day. Thank you so much for this recipe! We appreciate all of your hard work. God bless! Thanks Dawn!! Have a great day! That looks so good! Great now I am hungry. Thanks Jennifer 🙂 Have a great day!! I love this recipe! I like beans and dips!!! What the what? WOW this is simple and looks AMAZING! Thank you for sharing!!!! I love vegetarian recipes. Thanks Shannon!! And thank you for visiting! 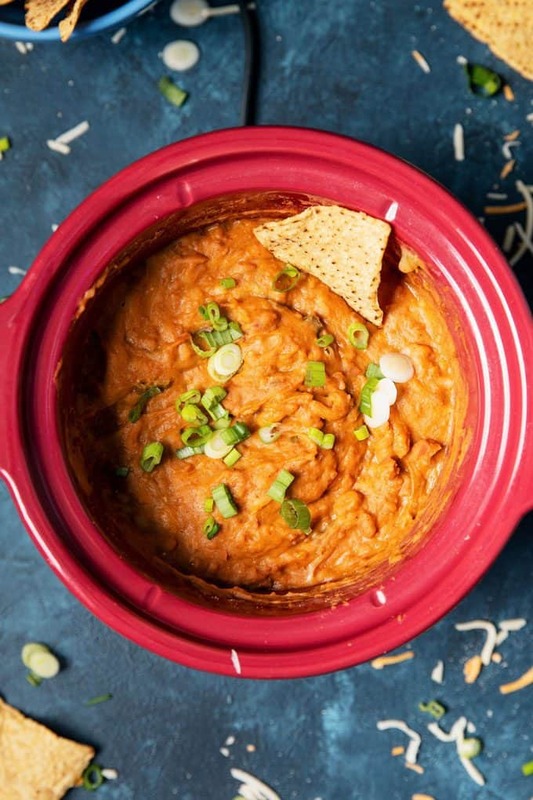 I absolutely love bean dip! Especially a delicious homemade recipe like this! So simple, so tasty and so good for you! Thanks for sharing!